Intel's upcoming Broadwell desktop chips look expensive, but this is to be expected. WCCFTech recently published an article pointing out that Intel's (NASDAQ:INTC) upcoming desktop processors, known as the i7-5775C and the i5-5675C, will be priced at $479.99 and $349.99, respectively. These parts will be based on Intel's Broadwell architecture, first introduced late last year. Keep in mind that these are said to be "preliminary" prices. Once these products are officially launched, the pricing could differ a bit. I believe, however, that Intel will price these chips at a premium relative to the current Haswell offerings, as well as the future Skylake desktop chips -- the follow-on architecture to Broadwell -- reportedly coming in August. WCCFTech's Hassan Mujtaba says he's "shocked" at these prices, but I'm not. Here's why. For some context, the Core i7-4790K -- which is Intel's highest-performing mainstream desktop CPU -- sells for about $330 online. The i5-4690K, Intel's highest-end unlocked Core i5 chip, sells for about $240. That's why it might be a bit surprising to see the i7-5775C and i5-5675C priced where they are. However, the 4790K and the 4690K are what Intel refers to as "4+2" configurations -- four processor cores and GT2 graphics. The 5775C and 5675C, in contrast, are "4+3e" configurations. This means that they also have four CPU cores; but they're also equipped with GT3 graphics, which takes up much more chip area than GT2 graphics does. These parts also have relatively large on-package eDRAM chips built in Intel's 22-nanometer process. Put simply, these chips are just significantly more expensive to build than a 4+2 configuration would be, which is why Intel is reportedly charging a premium. WCCFTech says that the unreleased i7-6700, which is based on the successor to Broadwell and is known as Skylake, is priced at about $390 on NCIX.com -- the same site that the 5775C/5675C prices come from. Don't worry too much about the pricing in absolute dollar terms -- we'll know the actual prices when the chips are formally launched -- but note that the i7-6700 is cheaper than the i7-5775C. This, unsurprisingly, is likely due to the fact that this chip is, like the Haswell-based 4790K, a "4+2" configuration with four Skylake CPU cores and GT2 graphics. The CPU and graphics architectures will be newer than what will be found on the Broadwell chip, but the die size itself should be smaller and thus cheaper to produce on the same 14-nanometer manufacturing process. Additionally, Intel won't be including a relatively costly hunk of eDRAM on the Skylake part, which further reduces its costs. 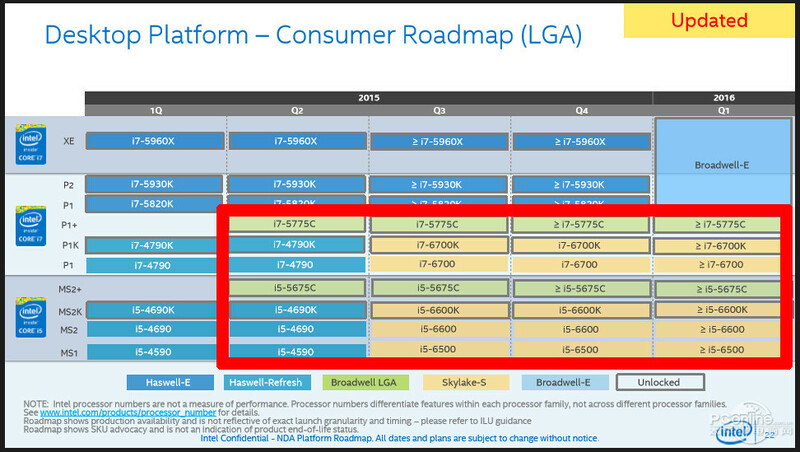 In an Intel desktop product roadmap that has been circulating around the Web (you can see it here), Intel positions the Broadwell-based i7-5775C in a tier above the upcoming Skylake-based i7-6700K. The i5-5675C is also positioned above the Skylake-based i5-6600K. This product positioning fits perfectly the notion that these 4+3e Broadwell chips will be priced higher than the Skylake-based 4+2 chips. Will anybody pay for the additional graphics? The big selling point for both the i7-5775C/i5-5675C is the fast integrated graphics. Despite the fact that these parts will be using an older graphics architecture than Skylake, the Broadwell desktop parts here are expected to have twice the graphics "cores" compared to the Skylake ones. This means that in graphically intensive applications, the Broadwell parts should be much faster than the Skylake parts when the integrated graphics are being used. The question, then, is who will actually buy these parts? For system vendors who would like to avoid the use of a low-end discrete graphics chip -- think all-in-one PCs such as the 21.5-inch iMac -- the Broadwell parts might make sense. However, for users who don't care about graphics performance or will be putting in stand-alone graphics boards into their systems, the Skylake parts -- once they launch -- should be the clear choice.